We started working with Goldfish in 2009 as their agency of record, meaning we took on all aspects of their marketing needs including branding and advertising, website and mobile design, corporate identity, location signage, etc. 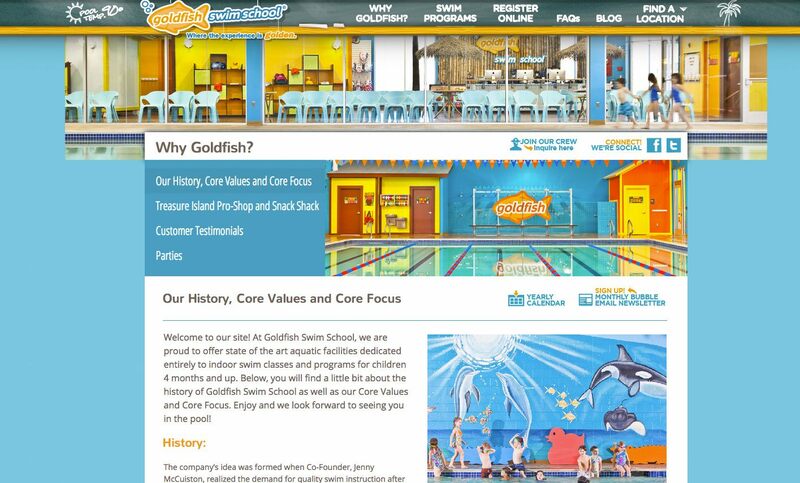 At the time, Goldfish had only one location and was working on franchising their business. Formcode provided signature design and extensive marketing that helped their brand franchise grow to 20+ locations nationwide. The company’s idea was formed when Co-Founder, Jenny McCuiston, realized the demand for quality swim instruction after teaching swim lessons at a local swim club in the Summer of 2000. She became increasingly busy with customers, and her business grew steadily throughout the Summer. Then, in the Summer of 2004, Jenny decided to teach swim lessons at a nearby Country Club. Jenny, again, realized the great need for quality swim instruction as she regularly accumulated a waiting list and her clientele grew to record-breaking numbers for the club by Summer’s end.